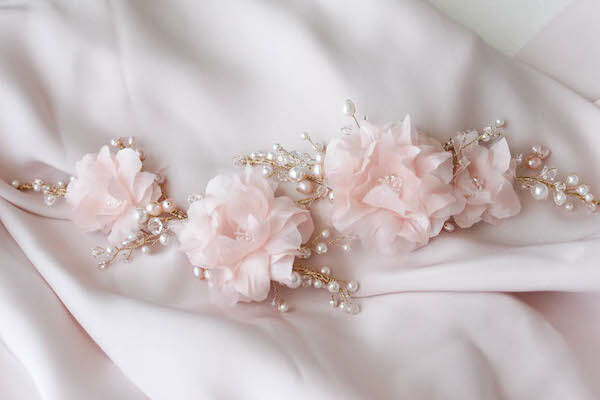 One of my favourite looks from the 2014 wedding season was the popularity of soft pink and blush wedding dresses and pink toned bridal accessories. Excitingly, 2015 is set to be another year of gorgeous pink tones which I’m beyond thrilled about. I love how effortlessly soft pink adds a romantic and feminine feel to a bridal look. Glamorous and oh-so-sweet! It was such a pleasure to work with US bride Kate to create a bespoke bridal headpiece featuring hand-dyed silk flowers and gold accents. Kate will be wearing her hair half up/half down with soft curls flowing down her back. To finish her look, I worked with Kate to design a wild and whimsy bridal headpiece to adorn her luscious locks. I love combining soft pink with gold, and the ivory and blush freshwater pearls scattered along the piece add the loveliest shimmer. Creating silk flowers is one of my favourite things to do, and as you may have noticed, all of my flowers are completely handmade from scratch so that means they are completely customisable! 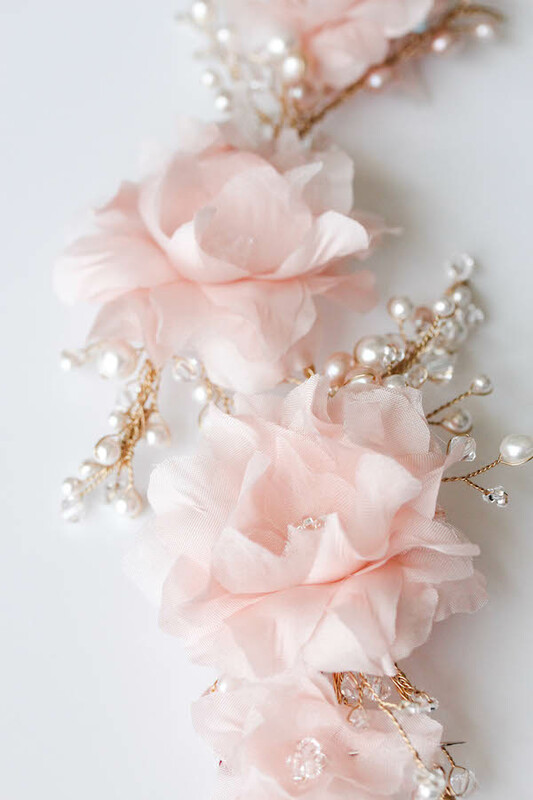 The smallest flowers on Kate’s headpiece are just under 2 inches wide but they can be made in any size, shape or colour. Prefer a fuller, rose or peony-like bloom? No problems, just ask and I will see what I can do for you! Kate’s custom headpiece pulls in details from a number of different pieces from the collection – the Giselle, the Sage and elements from the Juliet bridal comb. 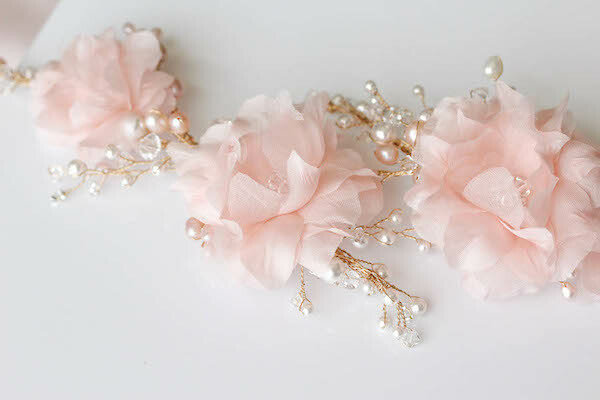 Shortly I will also be posting photos of 6 bridesmaids headpieces I designed for her gorgeous girls. Each handmade in golden tones with the prettiest pearls scattered along the piece for a softly feminine look. Fancy a similar piece or searching for the perfect piece but it only seems to exist in your head? Why not get in touch and we can start chatting about designing the perfect bridal headpiece for your wedding day.